What if we told you that every time you booked a hotel room, someone was being offered the same deal for significantly cheaper. Often, we take fluctuations in accommodation price as part of the cost of travel. However, it’s easy to find the most affordable hotel rooms once you know this insider secret. It has been estimated that there are around 500,000 hotels in the world. From grand 5* experiences to budget motels, these home-away-from-homes house millions of avid travelers per year. In fact, the global industry is worth an impressive 554.64bn annually. On the other side of the spectrum, hotel users are searching for better deals more than ever before. The introduction of aggregator and comparison sites means it’s harder for hotels to charge a high rate to unquestioning guests. Today, we want to know we’re getting the best for our money. Unfortunately, unless you have hours of research time to spare, this isn’t always possible. To help you find a holiday you deserve, we’ve compiled advice from experienced travelers, to bring you the best-kept secrets for finding the best price for your vacation. Your IP address tells online bookings websites valuable information about you. From this data, they can identify your location to an individual city and zip code. When making an online hotel reservation, providers create an economic profile based on where you are. Cheap hotels are often reserved for users from areas of lower affluence. Similar discounts are also often given to people who live in that area. Other details are also relevant to online booking websites, such as what device you use to make the booking (PC versus laptop versus mobile) and the operating system (Android versus iOS, and Windows versus Mac). 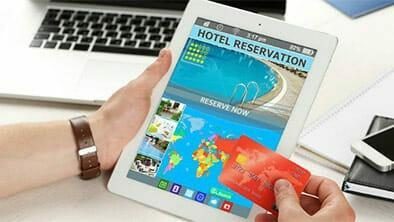 In fact, a 2012 study revealed that online hotel booking websites offered more expensive options to Mac users, as it is often assumed they spend more than their PC counterparts. This kind of targeted advertising often stands in the way of finding cheap hotels. Most online booking websites also store cookies, to track the choices in which you show the most interest. Don’t be surprised to see a significant price hike on hotel rooms you view regularly. We put this theory to the test by comparing hotel prices as seen from different locations. Initially, we searched for hotel rooms in Los Angeles, USA, from a European computer. The Price came out at $204. Next, using a VPN, we connected to a US server and inputted the same search. Incredibly, the cost of the exact room, at the same hotel, was nearly $30 cheaper! It’s easy to book cheap hotels online with a VPN. This type of software works by masking your IP address and assigning you with a new one every time you reconnect. One obvious advantage of this is that it makes it harder for websites to track you using cookies. However, by connecting to servers in different countries when searching for cheap hotels online, you can also beat location price discrimination and ensure great deals! VPN providers own servers in numerous countries. Once installed, you can manually select the location and adopt an IP address from that area. By trying a number of different options, you can find cheap hotels anywhere in the world. Here is a list of our top recommended VPN service providers. ExpressVPN is a top provider that thrives on offering a reliable and trusted service. It works quickly and efficiently, to make researching travel deals easier than ever. The main VPN protocol boasts military-grade encryption so that you can browse on-the-go. ExpressVPN also offers additional features to streamline your online experience further. $6.67/month with an annual membership – plus, an extra three months free! Read our full ExpressVPN review and Sign up with ExpressVPN here. NordVPN is another highly-rated VPN provider. Though their speeds are not quite as impressive, they boast some exclusive privacy features so you can ensure your online activity is safe. There’s no shortage of servers, particularly if you’re looking for hotels in Europe. Your NordVPN subscription can be used on numerous devices simultaneously, which is ideal for long-term travelers and digital nomads. Read our full NordVPN review and Sign up with NordVPN here. HideMyAss may not be the best VPN provider, but for finding travel discounts, it’s definitely worth considering. The main allure is that they host servers in 190 countries – pretty impressive considering there are only 194 UN states. The VPN client is intuitive and straightforward, which is ideal for beginner users. They offer numerous platform-support and payment options, to make life more convenient for you! Servers in almost every country. Book with Flights. Websites often offer discounts when you buy flights + hotel together. Travel Off-Peak. Peak season is unavoidably more expensive. If you can book your trip when it’s less busy, you’ll be able to cut the costs and avoid annoying crowds. Choose Non-Central. We’re used to opting for the closest hotel to the city. However, if you chose accommodation on the outskirts, even with the added cost of bus/taxi fare every day, you can save substantially! Last Minute Discounts. Websites – such as LastMinute.com – offer discount prices on hotel rooms they can’t fill. If you can wait to book, this can often be the cheapest choice. Comparison Sites. The endless comparison sites make it easier to find the best-priced place to stay. However, it’s wise to check more than one to ensure a top deal. Many imagine Airbnb rooms as grubby spares in the house of a stranger. In reality, plenty of full property listings offer the same glamor as a hotel stay. Private Hostel Rooms. Similarly, many people avoid hostels as the dorm-room concept brings them nightmares. However, they often offer 2-4 person private rooms also available, that are generally cheaper than the same sized hotel suite. When searching for cheap hotels online, don’t settle for the first price you see. Get the best VPN you can compare and research deals to ensure you are getting the best available. We recommend you use ExpressVPN to find cheap hotels as it offers the widest range of server locations.